This 12-Minute Chicken and Broccoli recipe is ultra-quick and easy to make, and tastes SO delicious! 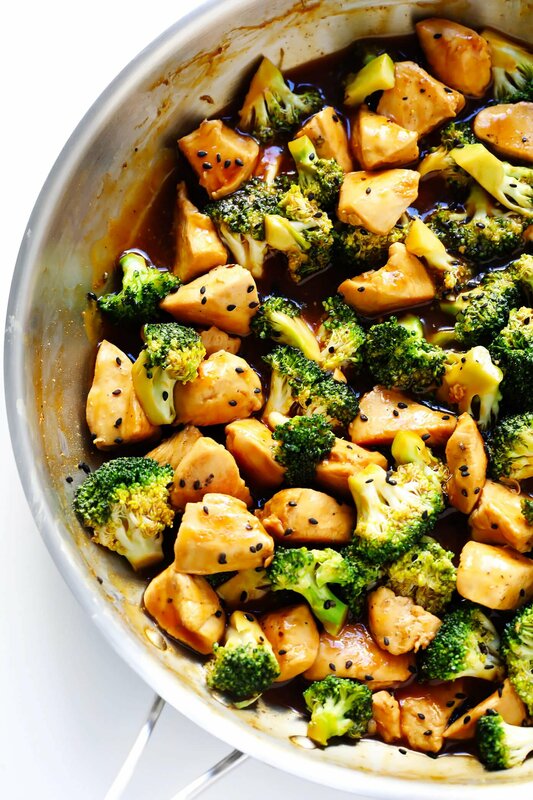 This easy Chicken and Broccoli recipe won’t let you down. 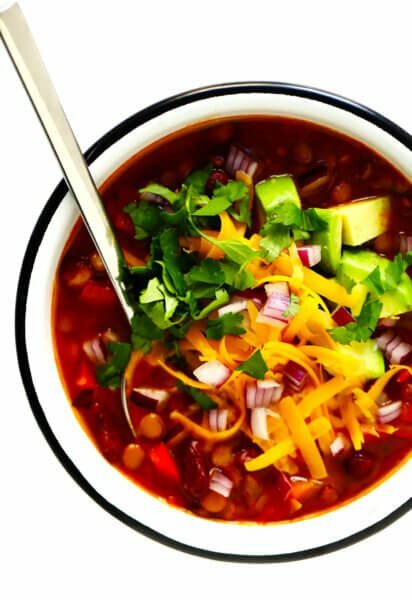 It’s been one of my go-to quick and healthy dinner standbys for years and years now. And, since I first posted this recipe on the blog four years ago, thousands of you have now also made and loved it, and reported back that it’s one of your faves too. Understandably! 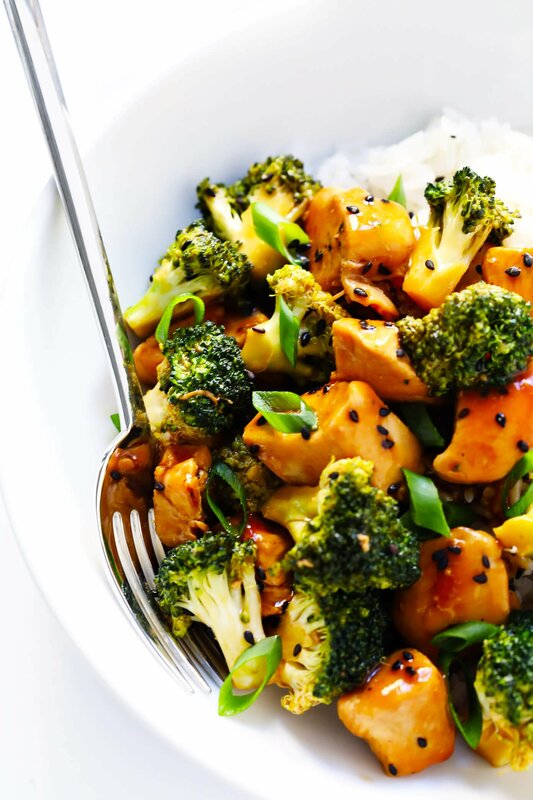 This one is incredibly quick and easy to make, the zesty stir-fry sauce is made with simple ingredients you like keep stocked your pantry, and that classic duo of chicken and broccoli always has a way of hitting the spot. 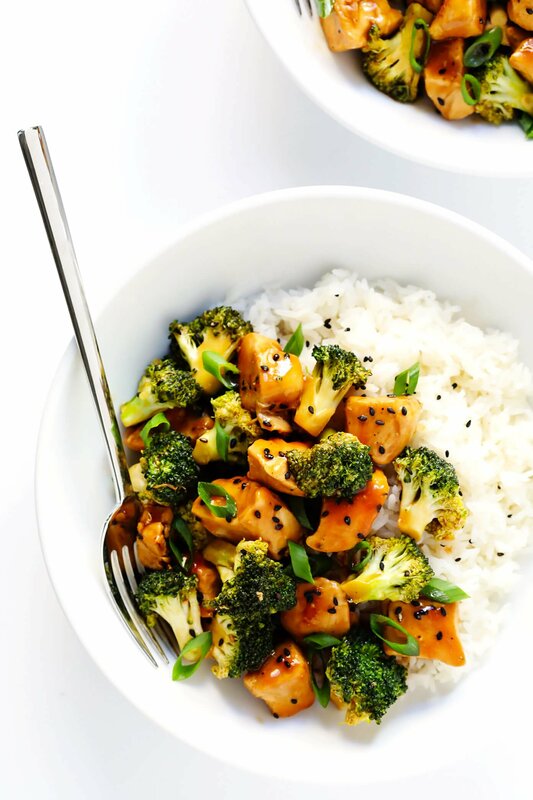 Simple and healthy stir-fry FTW! That said, as much as I love the classic chicken and broccoli combo, I should note that this recipe’s incredibly versatile if you want to mix things up. For example, feel like subbing in a different protein? Go for it. 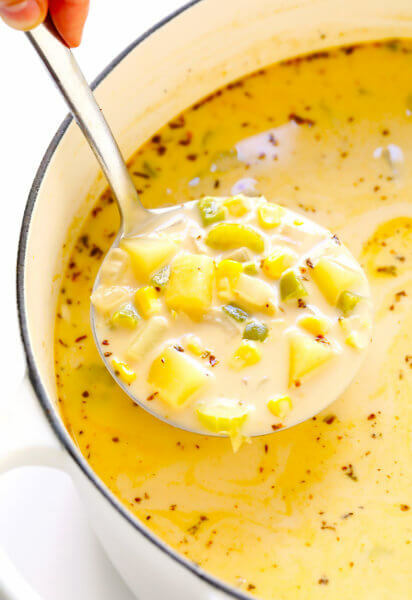 Have some leftover zucchini or onions or bell peppers or other veggies on hand? By all means, toss ’em in too. Feel like serving it up over quinoa or noodles, or even just some sautéed greens? Use whatever you have! The sky’s the limit for customizing here. But…this base recipe is an excellent one to bookmark as a good place to begin. As I shared in my original post about this recipe, the inspiration for this one came back in the day from my Burmese friend, Si Si, who loaded me up one summer morning with a CSA bag overflowing with fresh broccoli, since she knew it was my fave. That said, since the initial photos of this post were looking a little tired, I decided to snap some new ones this month to give this post a little update. Plus, we have two snazzy new videos ready for you too! As you can see, there’s not much to it. Just cut up a few chicken breasts into bite-sized pieces. Sauté them in a skillet until cooked through. Then add the chopped broccoli and sauté for a few more minutes with the chicken, until it turns bright green and slightly tender (but I like mine to still be very crisp). Then meanwhile, as the chicken and broccoli are cooking, whisk together a simple stir-fry sauce. As I mentioned above, I’ve kept the ingredients for this one limited to a short list of pantry staples. So (hopefully!) it should be an easy one to whip out, without having to make an extra trip to the store. Just stir it in at the last second and stir for a minute or so, until thickened. Then this quick and easy dinner will be ready to go! 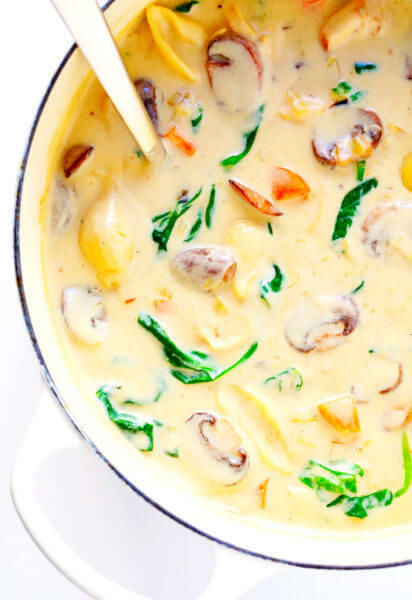 And as the title promises, if you have those ingredients ready to go and are moving at a lively pace, this one really can be ready in just 12 minutes. Boom. Heat 1 tablespoon olive oil in a large sauté pan over medium-high heat. Add chicken breasts, and season with a generous pinch of salt and pepper. Cook for about 5 minutes, stirring occasionally, until the chicken is browned and mostly cooked through. Once the chicken is browned, add the remaining 1 tablespoon of olive oil and broccoli, and stir to combine. Continue cooking for an additional 3 minutes, until the broccoli is bright green. Stir in the sauce, and cook for an additional 1 minute until the sauce has thickened. Remove from heat and stir in the sesame oil until combined. 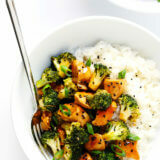 Serve warm, garnished with green onions and toasted sesame seeds. Or transfer to a sealed container and refrigerate for up to 3 days. For some reason all five stars didn’t post when I wrote my review; I’m pretty positive I clicked on all the stars. I apologize for leaving off a star, because this is definitely a five star recipe. I’ve made it previously, and will continue to do so. Thanks again! Substituted yellow onions for green and powdered ginger for fresh and it was still SO delicious! Will be making this again. Hubby approved. Very easy and delicious !! The sauce was the best part. It was so easy to make, and took no time at all. What a yummy dish that you can put together after work, when everyone is hungry. This will go into my dinner rotation!!! This was super easy, fast, and DELICIOUS!! Thank you!! This was great! Easy and delicious! I’ll definitely be hanging on to the sauce recipe. So good!